Samsung has announced a whole raft of new Android phones, including the Samsung Galaxy Ace, Galaxy Fit, Galaxy Gio and Galaxy Mini, each of which featuers the same TouchWiz user interface as the Galaxy S, and each of which is lower specced than the other! None of the phones are particularly well featured – these aren’t your flagship phones – but they all offer the Android experience, and should be extremely affordable when released. So what have we got in the range then? 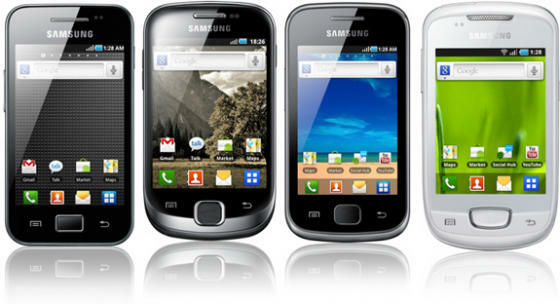 The most interesting is the Samsung Galaxy Ace, but it’s only interesting in the sense that it’s the highest specced of the four. With an 800MHz CPU and 3.5″ screen, though, it’s still no exactly high-specced, and so sits very firmly in the mid-range league. Still, it should be a very usable Android phone, and if it’s priced low enough, it should be more than competent. I should have a review of it in the next few days. Next up is the oddly named Samsung Galaxy Fit. Featuring a 3.3″ screen and 600MHz processor, it’s got all the features of a 2009 Android phone such as the HTC Hero (although Android as a piece of software is much faster than it was back then, so it should still run much faster than the Hero did). The even more oddly-named Galaxy Gio has even smaller display at 3.2″, but takes the processor speed back up to 800MHz, while dropping the camera down from the 5 megapixels of the Ace and Fit, to just 3.2 megapxiels. Finally, we have the Samsung Galaxy Mini. Not to be confused with the Sony Ericsson Xperia Mini, which was actually a decent phone in a very small body, the Galaxy Mini is a crap phone in a small body! A tiny 3.14″ screen, 600MHz CPU and 3 megapixel camera are all you get. Impressively, despite their weak hardware and undoubtedly low price, all of these phones run Froyo (Android 2.2) and come with aGPS, 7.2Mbps HSDPA, accelerometer, compass and proximity sensor that you expect from an Android device. Expect them to be on display at MWC 2011 in a few weeks’ time.